Sign up and register to become blood and organ donor. This year marks 550 years of the birth of the 1st Guru, Sri Guru Nanak Dev Ji who began the concept of Langar and Seva. The main idea behind the concept of Langar is community dining, equality amongst people and the feeling of oneness and sharing. We would like to commemorate and honor the first Guru’s life and teachings by raising awareness and encouraging more people to sign up and register to become blood and organ donors. While Langar Aid predominantly support with feeding the homeless, we are also keen to promote the ideals of selfless service which is very much rooted within the Sikh faith. 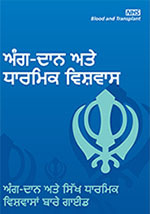 Sikhs perform many kinds of voluntary service caring for every aspect of the Gurdwara (place of worship) and Langar (community kitchen) facility. Seva is also performed on behalf of the community outside of the Gurdwara setting. The Sikh Gurus devoted their lives for the benefit of humanity and some even sacrificed their lives looking after the welfare of others. Many people would not be alive today if donors had not generously given their blood. This is despite black, Asian and minority ethnic communities representing around 14% of the population. Langar Aid want to help and try and readdress this balance. Around 6,000 people are waiting for an organ transplant across the UK. On average, three people a day die in need of a transplant due to the shortage of people willing to donate their organs. 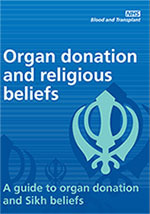 There is a particular need to increase the number of people from black and Asian communities who become organ donors after death and who donate a kidney during their lifetime. People from black and Asian communities are more likely to develop high blood pressure, diabetes and certain forms of hepatitis than white people. This makes them more likely to need a transplant. Although many black and Asian patients are able to receive a transplant from a white donor, for many the best match will come from a donor from the same ethnic background. Unfortunately, donation rates from these communities are a lot lower than for white people. By increasing the number of black and Asian deceased organ donors and living organ donors each year, we will narrow the waiting time gap and save and improve the lives of more black and Asian patients.